Just a quick post to wish you all Happy St. Patrick’s Day and share our dinner with you. We celebrated St. Patrick’s Day one day early because Brandon won’t be home for dinner tomorrow night. I made corned beef, cabbage, potatoes and soda bread. For some reason, I’ve always been a huge corned beef fan and asked for this dinner all the time when I was growing up! Due to time constraints, I had to make the corned beef in the crockpot. I was leery that it would dry out but it actually turned out pretty well. I think I’ll still prefer boiling it in the future but this worked for a weeknight dinner. I cooked the vegetables and potatoes separately using some of the cooking water for the corned beef when I got home. The cabbage wouldn’t have fit in the crock pot and I knew it would be complete mush if I let it cook all day. This was my first time making soda bread and we really enjoyed it. It was super simple to make and tasted great. A nice accompaniment to an Irish feast! I opted to use a very basic soda bread recipe – we weren’t interested in caraway seeds and golden raisins. I would describe it as a cross between a biscuit, scone and bread. I enjoyed a slice with butter and jam after dinner! Corned beef and cabbage will always remain one of my all-time favorite dinners! We can’t wait to enjoy the leftovers. Place corned beef in a slow cooker with seasoning packet, garlic cloves and bay leaf. Add water until barely covered. Cook on low for about 6 hours, until fork tender. Cut cabbage into quarters and place in a large stockpot with potatoes and carrots (if using). Add some of the water from the corned beef plus enough fresh water to cover. Bring to a simmer and cook for about 45 minutes, until cabbage and potatoes are tender. Preheat oven to 425 degrees. Lightly flour a baking sheet. Whisk together flour, baking soda and salt in large bowl. Mix in enough buttermilk to form moist clumps. Gather dough into ball and turn out onto lightly flour surfaced. Knead just until dough holds together, about 1 minute. Shape dough into 6-inch by 2-inch-high round. Place on prepared baking sheet and cut a 1-inch-deep X across top of bread, extending almost to edges. Bake until bread is golden brown and sounds hollow when tapped on bottom, 30-35 minutes. Transfer bread to rack and cool completely. This looks wonderful! 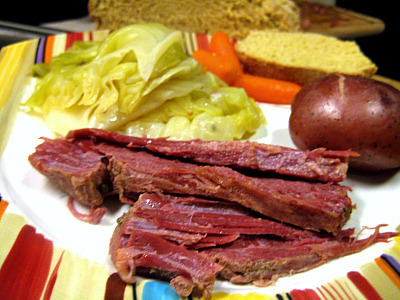 I’m totally jealous of everyone that had corned beef and cabbage today — especially homemade! Try adding Guinness beer to the crockpot! The beef basically boils in the beer. Tastes great. Kristin – that is such a great idea and so Irish-y 🙂 I will definitely try that next time we have corned beef (and it will be before next St. Patrick’s Day because I love it!). Hope you’re doing well. Thanks so much for your comment!